Renault is upgrading the Mégane range, giving it a more dynamic look, strengthening its powers of attraction and applying the new design identity. The new models feature the brand’s latest equipment and cutting-edge technologies including the Renault R-Link connected multimedia system. As with all the new vehicles in the range, the Renault Mégane family is taking on the new brand identity. 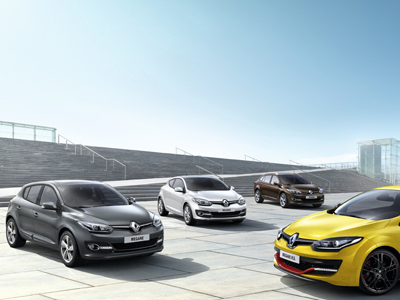 Mégane hatchback, coupé and estate now feature a new bumper, new vent grilles and a new hood bearing the enlarged Renault logo set against a gloss black background. The Mégane family of vehicles is now available with the EDC dual-clutch automatic transmission on the TCe 130 engine (without Stop & Start). The engineering department has re-tuned the engine by bringing in the turbo function faster and more frequently for enhanced performance. The re-tuning involved upgrading engine and transmission control software in order to better anticipate acceleration and pick-up. The EDC automatic transmission gains new shift pattern management.